The U.S. Postal Service frequently receives inquiries from members of Congress and their staff. 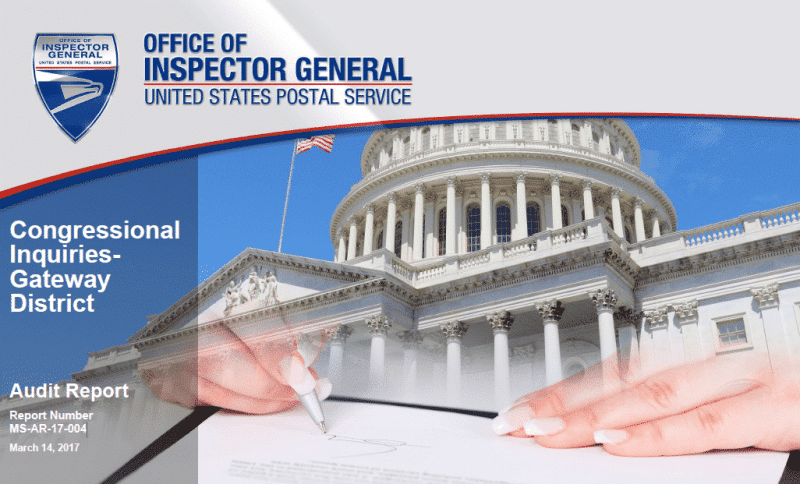 Congressional inquiries might include questions about service or changes in processing facility operations, or they might include complaints about mail delivery or decisions to change facilities. Government Relations officials – inquiries are tracked in the Correspondence Tracking System and the goal is to respond within 15 work days 90 percent of the time. District staff – inquiries are tracked in the Enterprise Customer Care system and the goal is to respond within 7 business days. Both groups coordinate with other field or headquarters staff (such as those within Facilities, Delivery, or Retail Operations) for assistance when needed. Waggoner, IL – the Post Office was placed under emergency suspension due to hazardous building conditions on March 2, 2015. Stonington, IL – on April 6, 2016, its retail area was closed and relocated to the back of the Post Office due to hazardous building conditions. This facility was not placed under emergency suspension. In an emergency suspension, a district manager suspends operations of a retail facility because an emergency or other condition requires such action. As of November 2016, eight Gateway District leased facilities were vacant or placed in emergency suspension, including the Waggoner Post Office. Our objective was to evaluate how congressional inquiries were handled and coordinated between Postal Service Headquarters and local management in the Gateway District. We specifically focused on the formal inquiries handled by the Gateway District staff members in fiscal years 2015 and 2016, and their responsiveness to informal inquiries from the Stonington and Waggoner post offices. The Gateway District effectively handled and coordinated the 61 formal congressional inquiries, responding in an average of 7 days. In addition, the district was generally responsive to informal inquiries regarding the Stonington Post Office, but did not adequately respond to several informal inquiries about the Waggoner Post Office due to a lack of information from headquarters’ Facilities staff. Specifically, Facilities staff was unable to provide complete information to the district about the timeline or estimated opening of the Waggoner office in response to various inquiries from Representative Rodney Davis’ staff between 2015 and 2016. For example, in April and June of 2016, the district was asked about opening dates. It did not adequately respond, instead waiting for specific actions by Facilities staff members who were responsible for coordinating and enforcing repairs. While Facilities staff continue to work with the landlord to complete needed repairs, as of February 2017 the Post Office remains in emergency suspension without a timeline or estimated opening date. Facilities staff attributed the lack of information to staffing shortages and complexities in working with the landlord. We recognize these challenges; but, a lack of timely and complete information impeded the district’s ability to be responsive and also negatively impacted the Postal Service’s brand, image, and interaction with customers. 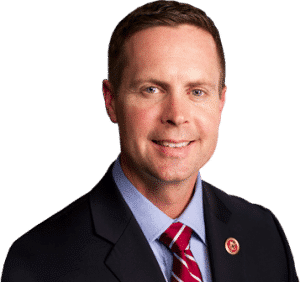 We recommended Facilities management provide the Gateway District timelines and a potential estimated opening date for the Waggoner Post Office and, upon receipt, the Gateway District management should provide the information to Congressman Rodney Davis’ office. This entry was posted in Downsizing USPS, General Union Business, Postal Reform and Politics and tagged Congressional Inquiries, Congressman Rodney Davis, emergency suspension, Gateway District, Illinois, Leased Facilities, USPS OIG Audit Report. Bookmark the permalink.